You are here: Virgin Islands News Online » News » Car crashes into FirstBank in Road Town! 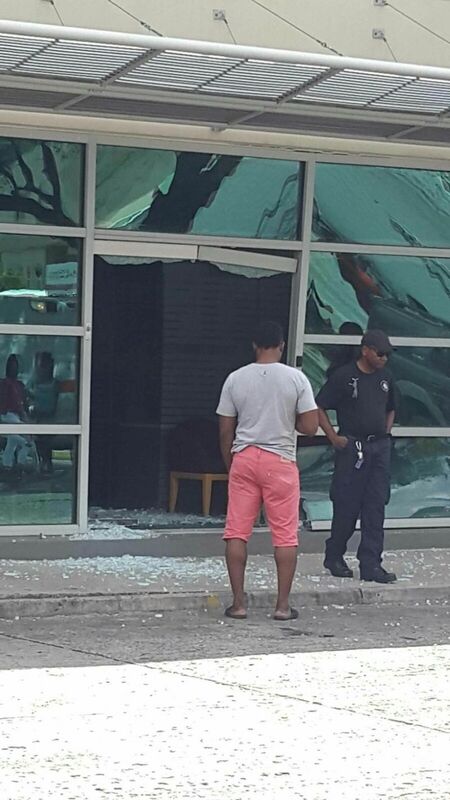 Car crashes into FirstBank in Road Town! ROAD TOWN, Tortola, VI- In a moment of error and panic, a driver of a small vehicle crashed into a glass door of FirstBank in Road Town, reversed and slammed into another vehicle before ploughing into a tree today, February 25, 2017. According to reports reaching this news site, the mishap took place around 12:00 PM. 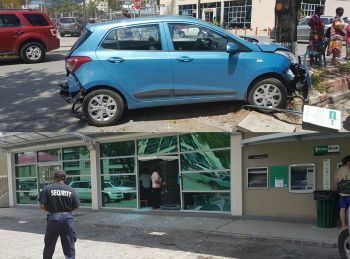 It is reported that the scary moment began when the female driver mistakenly put the car into drive instead of reverse and crashed through the glass door of the bank. In the moment of panic that ensued, the driver reversed on to the road but backed into a gray SUV. That was not the end, however, as the same driver ploughed the car into a tree. 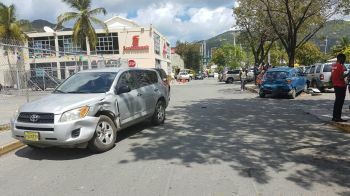 This news site was told that a group of tourists had to take evasive action during the moment of panic and even sustained bruises and cuts as they tried to escape being hit by the vehicle. 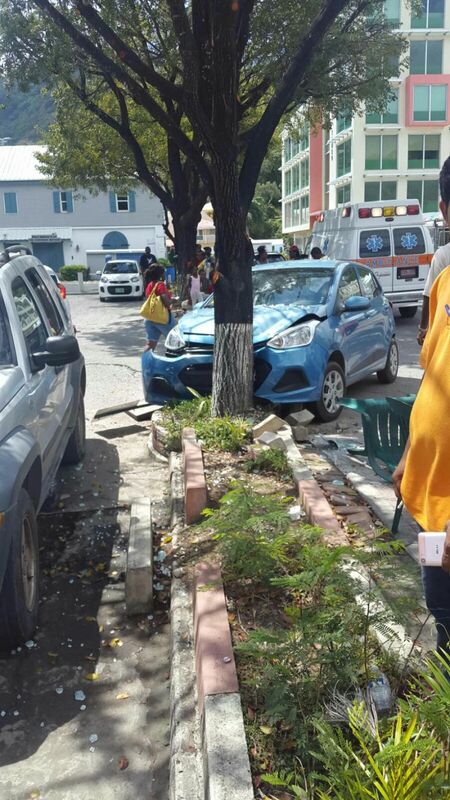 The injured tourists, along with the severely traumatised driver who suffered minor injuries, were taken to Peebles Hospital. 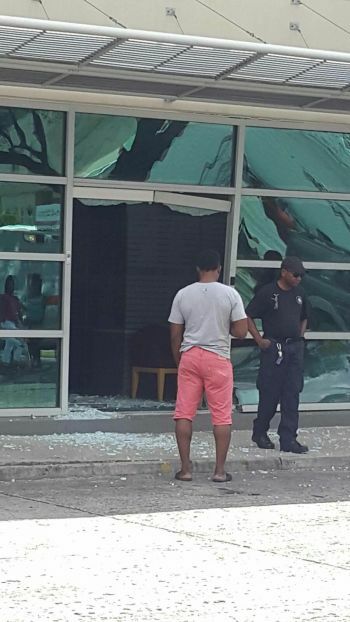 No one was reportedly injured in the bank. We brothers and sister living in this little paradise are so anxious and happy when something negative happen to some one we don't even wait to get our facts straight we hide behind the phone or computer and start saying so much negative things it's so sick to read.But God knows its all today for me tomorrow for you, praying for you my child what the enemy meant for bad God have your back he is in control. Mother, you are so right. Now I know not to believe in what bloggers blog about.. if you were there you would know what happened..in less than a minute the unfortunate circumstances took place.. there is no way a vehicle could run in the bank and just take off in reverse ram the gray jeep then hit in the tree, thankful for the cadets who were close by and the young man who was brave enough to run to her rescue.. please if you weren't there stop all the negativity.. because you never know..today for her tomorrow something different for someone else.. thank GOD she is ok and alive.. if you don't don't be mean.. Please, there is more to life. If you don't have money in the bank, you won't be able to make a withdrawal. Shocks!!! Must be q new driver so sorry to hear..
maybe his property is in foreclosure!!!! when you can't drive GOES HORRIBLY WRONG. In the moment of panic anyone can lose (Anyone). It could have been worse. Just like we in the BVI in 13th days or less we moved on like nothing happened. Hope I get a call about my loan now. Been waiting for too long. Hope the driver is OK. Can imaging the panic she felt. Forgive her. It happens to all of us. Put our vehicle in drive and looking back thinking its in reverse. So happen the bank was in the way and get hit most time we are in open roads when this happen to us..
A number of Foreigners from the Caribbean in the past bought their Driver's License from their Country without doing Written, Cone or Road Test and came here to the B.V.I and were given B.V.I Licenses just because they presented a Driver's License. They CANNOT drive. I'm happy to know that the DMV realized what was happening and put a stop to it. Obviously, that individual cannot drive and it will cost them. Thank God no pedestrian was hurt. DMV please DO NOT sell Licenses to no one. Let persons go through the right channels by doing their Written, Cone and Road Test. Bet you are uneducated. You sure sound so. What do you know about the driving history of the driver?. Do you understandable comprehension? What can of driving test are you talking about huh? trying to sway a cone is not a real test. the real test is going through traffic during rush hour and doing a normal drive around the town, So do not compare people coming in and trading cards. sad sad. and the 6 little questions that you have where everyone trades the answers before going and they are still retaking the test....well......ya....you guys do retakes for exams all the time. And how are you so certain that this is the situation in this case? I have been driving for years and there are occasions when I would put my vehicle in drive when I am meaning to reverse (or vice versa). Luckily, in those moments I was moving slowly enough to realize what's happening and were able to correct my actions before anything happen. As it appears the individual driving must have panicked from the first instance to the end (which does happen to some people once anything goes wrong). I'm happy that no one was seriously injured. Property can be replaced but not life!! Good thing the tree was there or else Scotiabank would be next...more trees in town please. It is time we remember the driver and her family! I can understand slamming into the bank glass and when trying to reverse she hit a truck but the tree has me puzzled. 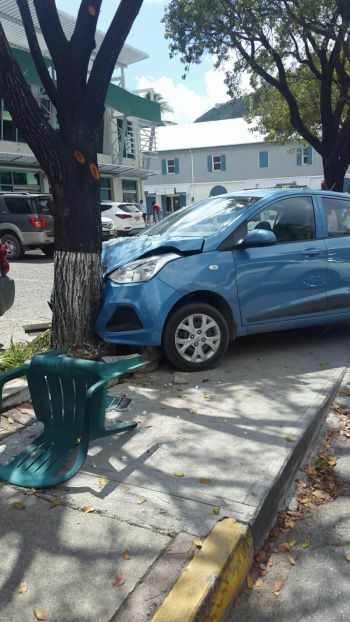 Was she trying to flee the scene because from the pictures she was going forward when she hit the tree. Just wondering. Why are you pissed lmao like how is this going to personally affect you? Someone should've taped this and submitted it to "WORLD'S DUMBEST" on channel 38....EPIC!!!!!! LOL i was saying the same thing!! That would be totally distasteful and heartless. I sincerely hope the driver is okay and that everyone involved recovers well. This is a BANK, an institution where money is kept overnight at times. The photos show quite well what happens to laminated glass and aluminum storefront frame when it meets with a vehicle. Now, imagine that a situation like the 2007 Glasgow Airport terrorist incident were to happen, where a vehicle is DELIBERATELY driven into a building with the intent to do harm. Not saying that is what happened here in the slightest, but this should be a wake-up call for the bank authorities and a prime opportunity to beef up bank security in terms of secure design. Your staff and customers will thank you for it. Bollards to protect the building facade, yes, but they may also want to consider upgrading their glass seeing as they are a bank. Bullet-proof/ impact resistant glazing should work. Young lady I hope you pray , because the devil is out for you ..
My wife and I were visiting your wonderful islands and taking money out of the cash machine as this happened. Young lady luckily did not hurt anyone and it all happened so quickly. The security man from bank was great and took care of her.. .. We wish her well it could have been a lot worse. Thank God and Gods Blessings to all.. When you fall off a horse get back up again.